Submit artwork for our annual Appalachian Trail Art Show! Join our Appalachian Trail Art Show celebrating the Trail and the surrounding Great Outdoors. The A.T. is a designated National Scenic Trail that stretches 2,200 miles from Maine to Georgia. It’s right in our backyard, less than 5 miles away, with local hotspots like Bear’s Den and Raven Rocks. Help us to connect our community with the A.T. by sharing your art! Once you have registered, please pay the $5.00 per piece registration fee below. The fee only applies to adults, all students may enter for free. The Round Hill Arts Center is pleased to announce a new exhibit for January 2019. Works by Harmony Middle School Arts students will be on display throughout the month, so make certain to stop by to see the wonderful work from these amazing young artists. An artist reception will be held Sunday, January 6, from 12:30 - 2:00pm. The Round Hill Arts Center is proud to announce a special holiday charity event hosted at the center from November 15th through December 31st as a way to give back to the community that has supported us all of these years. We are looking to make an impact in three main ways: Donations of food, items, and money; Art sales; and Art workshops. We ask that you help out in anyway that you can. We are setting up donation boxes to collect items and money for two local charities — Loudoun Hunger Relief and the Loudoun Pet Pantry. So please drop off any new, unopened, unexpired items in one of our collection boxes at the center. See our lists below. Also, 100% of all money donations collected during this time will be split among our two chosen charities. Donate at the center in person, or donate from the comfort of your own home, in your pajamas if you want, by clicking the button below. We will have art for sale at the center to raise funds to our chosen charities. One hundred percent of the proceeds from the sale will be donated. Find unique, one-of-a-kind gifts and items on our special charity table, drop a minimum $5 donation per piece into the donation box, and enjoy! All art has been donated by our instructors, students, and community members. We are offering special workshops for children and adults to make unique handmade items. There is no fee for the workshop, but we do ask that you make a small donation of items or money. See our website for our schedule of classes and workshops, and come out to work with clay, make jewelry, and more. The Round Hill Arts Center will once again play host to artists on this annual showcase of the arts. so, make a plan to stop by the center June 2nd and 3rd to check out the artwork of Carrie Althouse, Meredith Hilt, Mary Kenesson, Jeff Miller, and Anne Stine. Also, many of our current and former instructors will be on the tour, so make sure to check out as much art as you can! Share your talent! Whether it's poetry reading, dramatic reading, singing a song, or performing a musical or dance piece, Center Stage is open for you! Please register to let us know you're in. 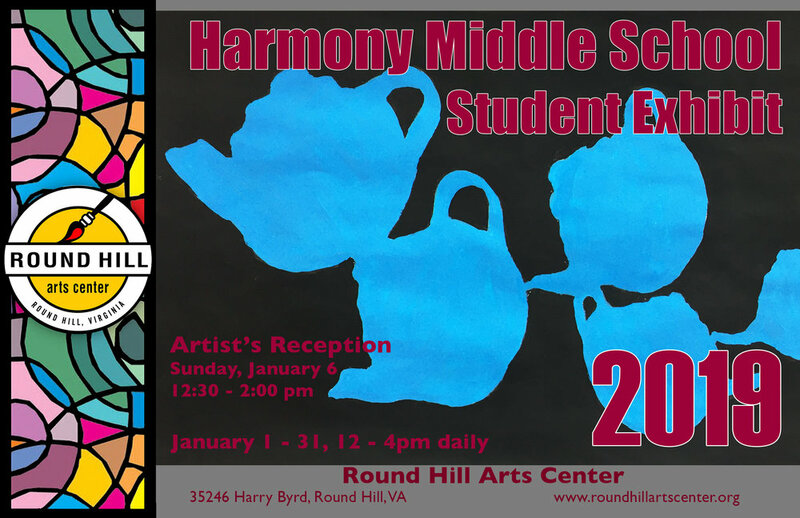 The Round Hill Arts Center is pleased to announce a new exhibit for May of works by Harmony Middle School Arts students. Stop by and check out all of the wonderful art by these middle school artists. An artist reception will be held Sunday, May 20, from 6 - 7:30pm. The Round Hill Arts Center is pleased to announce a new exhibit for April. Works by Woodgrove High School Arts students will be on display throughout the month, so make certain to stop by to see the wonderful work from these amazing young artists. An artist reception will be held Friday, April 27 from 6 - 7:30pm. The Loudoun Arts Council invited Loudoun high school students (including homeschool students) in grades 10 through 12 to participate in the Gale Waldron Excellence in the Arts awards program for 2018. The submitted work in the visual arts category will hang at the Round Hill Arts Center during the month of March. 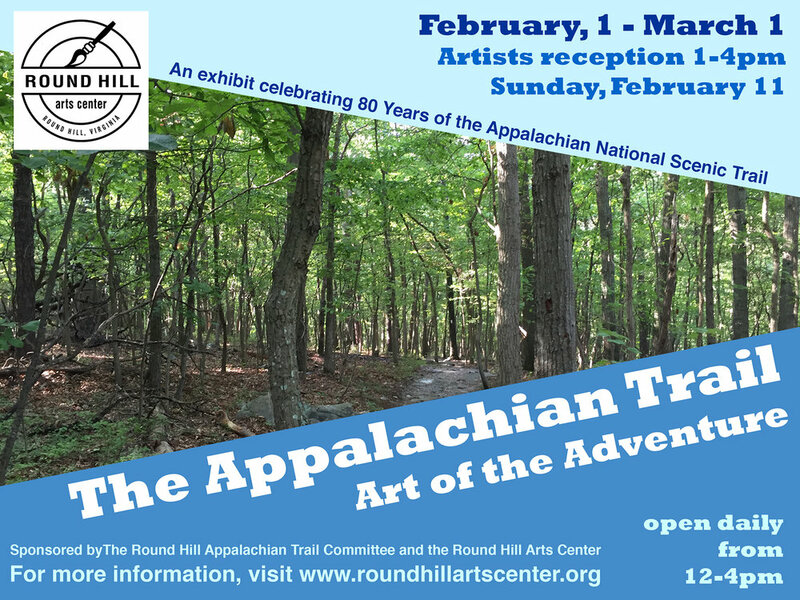 The Round Hill Appalachian Trail Committee and the Round Hill Arts Center invited area artists to participate in an art show entitled “The Appalachian Trail: Art of the Adventure.” The purpose of the show is to broaden public awareness and appreciation of the Appalachian Trail. Artists submitted a wide range of artistic expression, including paintings, drawing, photography, fiber arts, stained glass, and sculpture. There is a separate category that welcomes submissions from young artists in grades K-12. An Artists Reception will be held Sunday, February 11, 2018 from 1-4 pm. All are welcome!